Chances are, we’ll look back in some horror at the early smart device era - the era we're now leaving; the ‘Wild West’ of the attention economy. Phones and tablets have shattered attention spans, addicting many of us to the dopamine hits of colour and movement, personal validation, and nuggets of information. Anxiety and depression are on the rise among the young, and the age of distraction, echo chambers and filter bubbles is well and truly upon us. The reality is staring us in the face, with a ghostly blue glow. It’s not healthy. Humans did not evolve to interact this way. Voice, however, is right up there as a contender for ‘most natural human interface’ and this is great news for the future of digital - a future where digital doesn’t greedily grab all of our attention but is instead is integrated into our lives; it’s there when we need it, happy to wait until the moment we do, not intruding when we don’t. We already have some major players in voice, though none of these have quite cracked it yet. We are still at the stage of clunky interactions, and sometimes poor judgement as Google discovered with their natural speech robo-calling service. Microsoft has Cortana, Apple has Siri, Amazon has Alexa and their Echo range of smart speakers, Google has Home, and Facebook have just launched Aloha. There are more to come as each races to be the platform of choice. So it's a good moment to step back and think about what we want this voice activated future to feel like, how we want these services to behave, and how organisations can get the most from them. 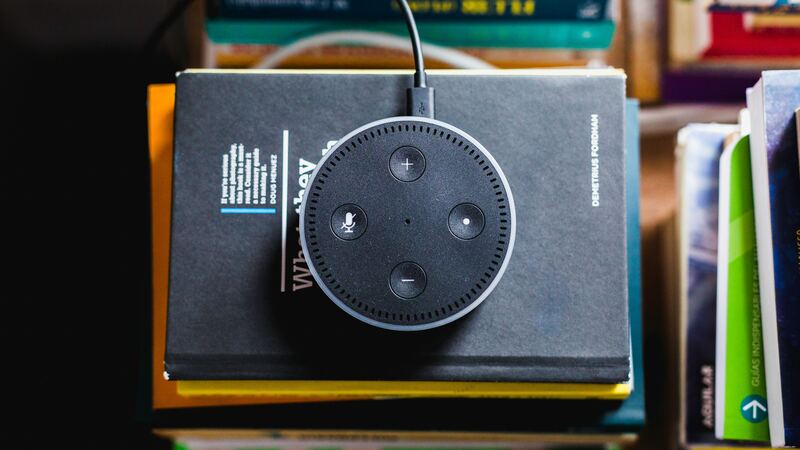 How can we ensure that these voice services are designed respectfully, and that they do indeed deliver on the promise of being the most quintessentially human experience? We’ve already seen the app ‘gold rush’. In June 2016 Apple’s App Store had over two million iPad and iPhone apps. Clearly they were not all in use, and a spring clean was ordered to remove spammy and outdated products. Of course there are scores of apps people find vital and useful, but every platform also has a high proportion of app landfill - unloved, unwanted, unused and perhaps unusable, or filling a need that was never really there. Voice presents an opportunity to not repeat history - to solve real problems, to make something meaningful, to create long lasting value that users return to. Designing and building a voice product or service in the right way will mean that you are there just when people need you, for just what they need, both now and in the future. Some digital products and services are the equivalent of jumping up and down in front of someone a few times a day shouting ‘Look at me! Love me! Love me even more!! I’m only a toilet paper brand but love me goddamit... and help deliver on engagement KPIs that have no rationale’. If this app was a person, we would worry about them. So how can organisations avoid this, and also avoid solely delivering on the agenda of the platform itself? Amazon didn’t create Alexa from a benevolent impulse, it’s a strategic play to further embed you into an ecosystem and capture more of consumers’ income as well as their data. Yet there is so much potential beyond purchasing. How will brands rooted in the visual realm translate to audio and retain a distinct identity? We’re about to enter a golden era for sound designers, I suspect. But there’s far more to it than that. We have to think about value, and what voice is good for. If headphones are not being used, the opportunity of the voice service and the smart speaker is to be inclusive, rather than exclusive – opening up, rather than closing down. But first we have to think about when sound is appropriate and useful, not annoying and intrusive. What are the pivotal moments where a voice service might come into play? And how does it relate to your ecosystem? After all, screens won’t disappear. When is a screen the right medium, and what should be done there? Clearly, browsing some types of product will always be a visual experience. It’s early days, so let’s focus on what we know voice is good for - connecting people. And because it’s audio, we need to focus on enclosed spaces - the home and the car are good examples. The car can be included because services like Alexa exist in an app, not on the smart speaker itself, making it portable. We know voice is easy to use, if designed well. Some devices have unwittingly created layers of experience - barriers like multiple remotes, multiple apps, waiting for logins, devices to boot before anything happens. In the past, you could whack a CD on and hear music within seconds – or turn a radio on more or less instantly – but a Sonos plus Spotify setup can mean minutes of launching apps, choosing devices, linking speakers, confusion over whose phone is connected before you hear a sound. Voice services can cut through the layers of sequential interaction clutter and bring back simplicity. They also don’t always need all your attention. You can multitask - your hands are free - and you can ask incidental questions that mean voice is integrated into another activity, rather demanding to be the only activity like a screen. For the price of a cheap TV commercial, a brand can create a truly useful product or service that users come back to time and time again, something that solves a real problem in their lives, or makes something troublesome easier and more delightful. For instance, imagine a recipe service integrated with grocery shopping. You could look up a recipe and tell the service how many people you are cooking for. It could adjust quantities and read the ingredient list out while you check what you have in the house. A shopping list could be created of whatever you don’t already have, and the order delivered just in time to start cooking. It then talks you through cooking the recipe step by step - complete with tips (“Alexa, what does ‘sautée’ mean?”) - finishing just as the meal needs to be ready. This would not be the easiest service to create, and there are some unloved early efforts already out there, but all the elements are now in place to create something truly enabling and seamless. Step-by-step help is an obvious choice – maybe even augmenting those notorious IKEA instructions – and there is a wealth of YouTube content from that could be audio only, allowing users to focus on practical tasks while working rather than looking at a screen. At Futurice, we see a key area of opportunity around voice services for families with children. This past year Kid Skills became available on Alexa in the UK and Germany giving family brands, especially those with their roots in content, the ability to be first movers. Household names have already jumped at the opportunity, from Sesame Street allowing kids to call up Elmo to National Geographic’s quiz letting kids put their geography knowledge to the test. Voice, rather than splintering family attention across multiple devices, has the potential to bring families together. This isn’t a nostalgic image of families huddled around the wireless - we see new opportunities for family interaction. Any services for and involving children need to be designed respectfully and sensitively, and we also see opportunity here for providing encouragement and esteem building. There’s plenty of research that could be used to ensure voice services role model positive reinforcement in learning experiences for example, rewarding kids for effort, not results. There are all sorts of moments in family life where voice services could fill a need, or relieve some difficult moments. For example, driving long distances, waiting in airports, learning new life skills, homework and exams, bedtime, when a child is home sick, when siblings are arguing, meal times, and games at the weekend. What about the ‘Helly Hansen Rainy Day Quiz’? Or perhaps an ‘RAC Bank Holiday Traffic Jam Quiz’. Or even ‘CBBC’s ‘Stop arguing!’ sibling argument defuser. TV shows could create new and relevant content - the ‘Who Do You Think You Are?’ game that encourages kids to find out about their grandparents lives and explore their family history in an entertaining format. And entertainment brands can extend the reach of their content and engagement. The BBC’s Blue Peter for instance has lots of online content that could be the basis for voice content. Voice also offers the opportunity to inspire kids' imaginations in a way that screen-based experiences cannot, reconnecting them with the environment around them. Imagine a game for a long car journey that creates a story linked to what kids typically can see from a car, creating a story as they go, encouraging them to invent parts of the story and responding as they do, turning “I Spy” from a turgid chore into something that is exciting and different every time. And when IoT devices hit scale, the scope for inspiring the imagination with in-home adventures becomes limitless, from flickering lights to mimic lightning, to Harry Potter magic, every home will have the opportunity to become an immersive storytelling experience. Organisations that already have the trust and respect of parents are well placed. The moment a brand starts trying to convert interaction with kids into sales, parents - the gatekeepers - will lose trust. So, don’t even try to monetise service like this. Instead, create highly valued interactions both parents and kids will return to again and again, creating brand awareness but also true value. This will offer brands more than any ad, and make some parents eternally grateful. In turn, you can foster loyalty and goodwill on a platform that could just as easily have reduced it. Designing class-leading digital services for kids requires respect and consideration. We’ve seen the damage lack of thought can do already, from the anxiety previously mentioned to the abuse of data via Facebook. Nobody will want to expose their children to services that have a negative impact. Some design principles are always helpful as a guiding light. 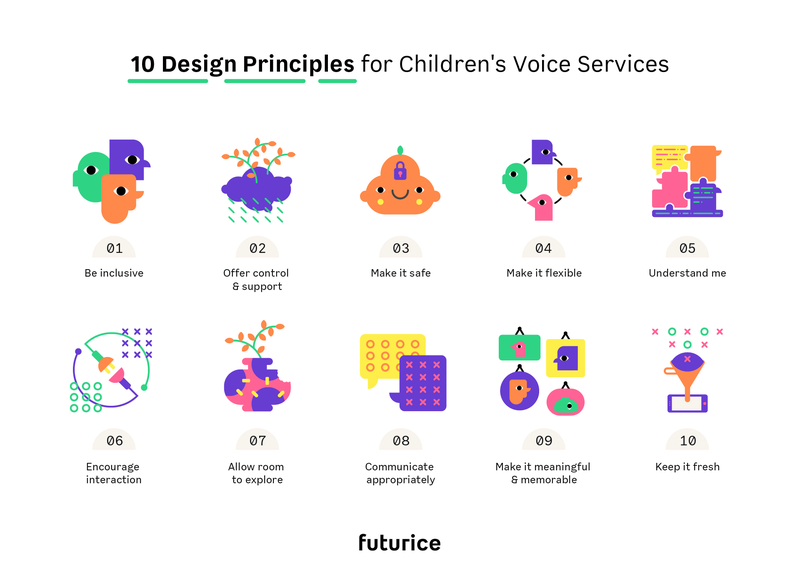 Futurice have already collaborated with UNICEF to create design principles for digital services. We have adapted these here to be specific for voice services. So, here are our Top 10 ways to design voice services well for kids. Do not discriminate against gender, age, ability, language, ethnicity or socio-economic status. Include children, parents, teachers, experts and communities in the design so that you not only understand needs but also have better ideas through collaboration. Help users understand how to have successful interactions by offering guidance. Consider where users might be in their development and nurture their growth. Help children acquire new skills and encourage them to try self-driven challenges. Ensure you provide children with a model for healthy digital interaction. Tell me why something is unsafe, and then prevent me from doing it. Make sure my guardians understand this as well. Is it safe for me to interact with the voice service alone? Treat data with respect and care. And remember some children may not fully understand the voice service is not a person. Consider different moods and contexts as well as open and fixed types of play or learning. Allow users to choose a path and keep opportunities open. The audience is active, curious and creative but it’s also OK to give them a break and offer breathing space. Before creating any product or service you should make time to understand the people it’s for. Take this just as seriously with children, parents and guardians. Expect to hear and listen sensitively for good ideas that might help. Combine this with conversations with people who are experts on the particular needs of young people. Children’s well-being, social life, play, creativity, self-expression and learning can be enhanced by collaboration and sharing with others. Voice services are perfect for shared experiences, so encourage active play that helps build relationships and social skills. Allow users to take risks and learn from their mistakes, and support users in fixing them. Be mindful of the time I need to learn something new. Help children to express themselves and find ways for them to contribute. Avoid the ‘digital landfill’ fate of so many smart device apps and ensure you are solving a real problem or making something genuinely enjoyable. Create an experience with the right level of personality and create memorable moments that children and families can talk about later as a shared experience. Voice services offer a format that should allow you to affordably add new content. This will encourage users to return and deepen the experience. Renewing content may mean a family can return with a child’s friends, siblings or relatives and have a rewarding shared experience.